Start by building your frame. I cut 2 pieces of 1x2 pine at 31 1/2" and 2 pieces at 25 1/2" with 45 degree angles at the corners. Then use wood glue and finish nails to nail the corners together. I took some scrap pieces of 1" pine and nailed one to the middle of the top and bottom and one to each corner The little scrap pieces will give your MDF something to nail into and rest on. 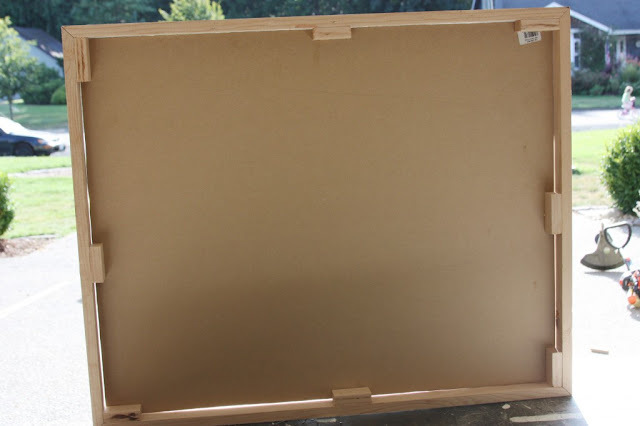 Cut your 1/4" MDF down to 30"x24" and nail it down from the top to little scrap pieces of pine. Now cut your sheet metal. Wear some heavy duty gloves because the edges are super sharp! I cut my sheet metal down to 30"x24" with tin snips. Then I primed the metal with Zinsser 123 primer and painted on 3 coats of Chalkboard paint with a 4 inch roller. Time for some paint! I used some spray paint and just painted the outside frame. 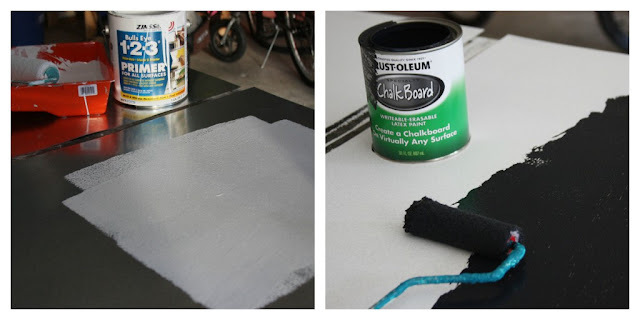 After the paint dried I used Liquid Nails to glue the painted metal to the MDF. 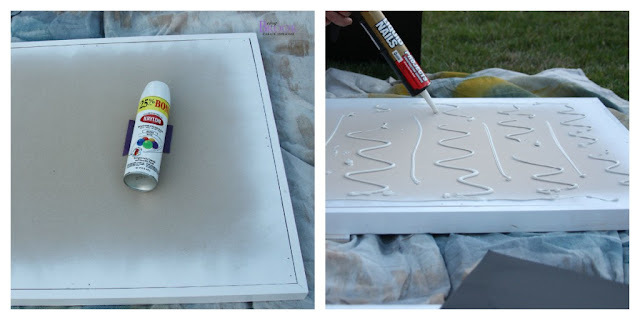 Smooth the metal out carefully and set some heavy books on the chalkboard overnight to help hold the metal down while the liquid nails dries. 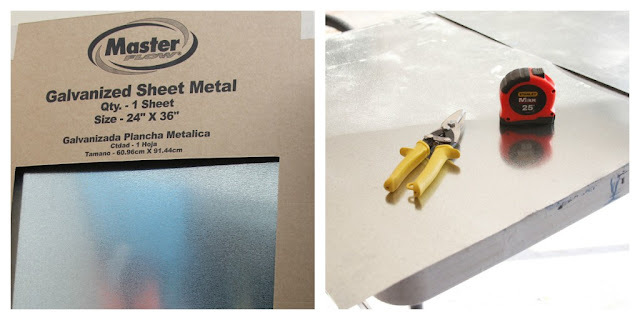 Now you are going to cover your metal edge with some 1/4" screen moulding. 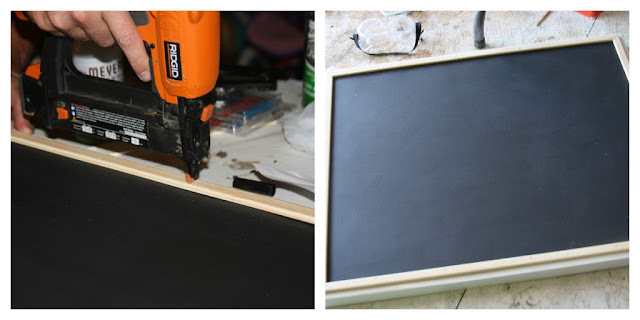 I cut 2 pieces of moulding at 30 1/2" and 2 pieces at 24 1/2" with 45 degree angles at the ends and nailed it to the 1x2 frame. 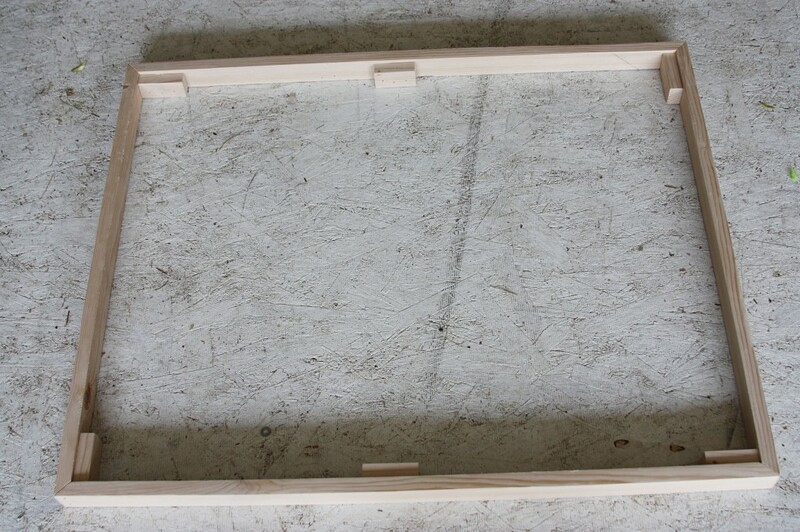 I wouldn't cut your moulding all at once I would cut it as you go to make sure it fits your project exactly. Then I covered the chalkboard and spray painted the screen moulding. 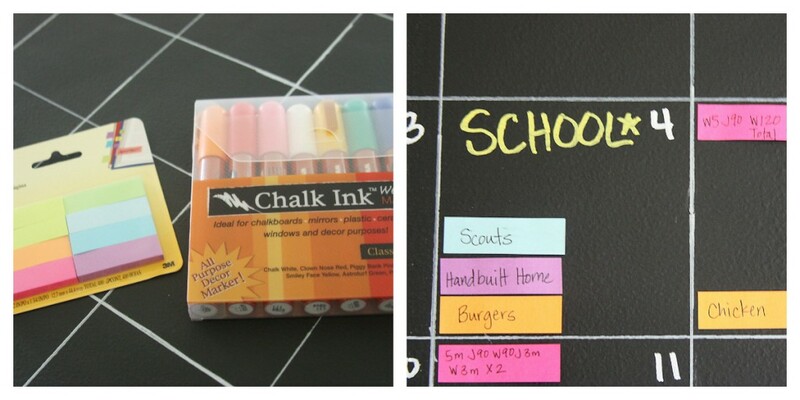 Now you are ready to make the chalkboard surface into a calendar. I used a ruler and pencil to draw my lines onto the chalkboard surface then drew over the pencil lines with a white paint pen. I used picture hanging hardware attached to back to hang my calendar. I used some chalk ink markers to write the month and days on my calendar. Chalk ink is great because it has to be wiped off with a wet wipe. The important events also got written in chalk ink. 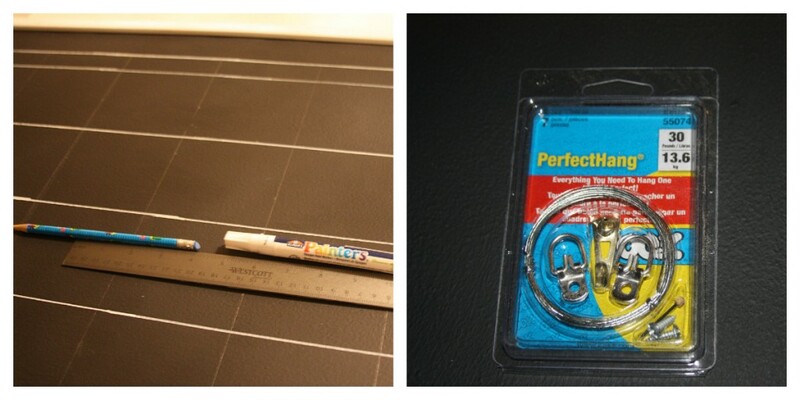 I bought some post it note tabs in different colors to write activities, workouts, menus and project ideas. 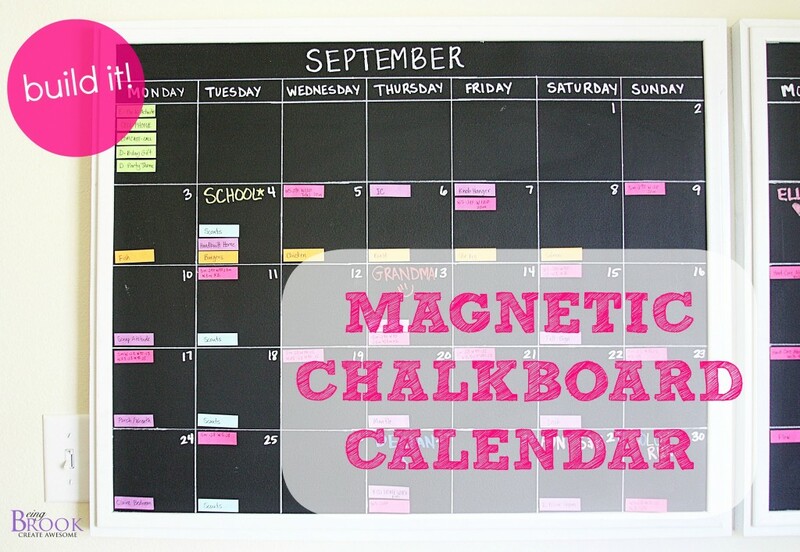 It would be great to type out your favorite meals and frequent activities and print them on magnet paper and you could just stick them right to the calendar! 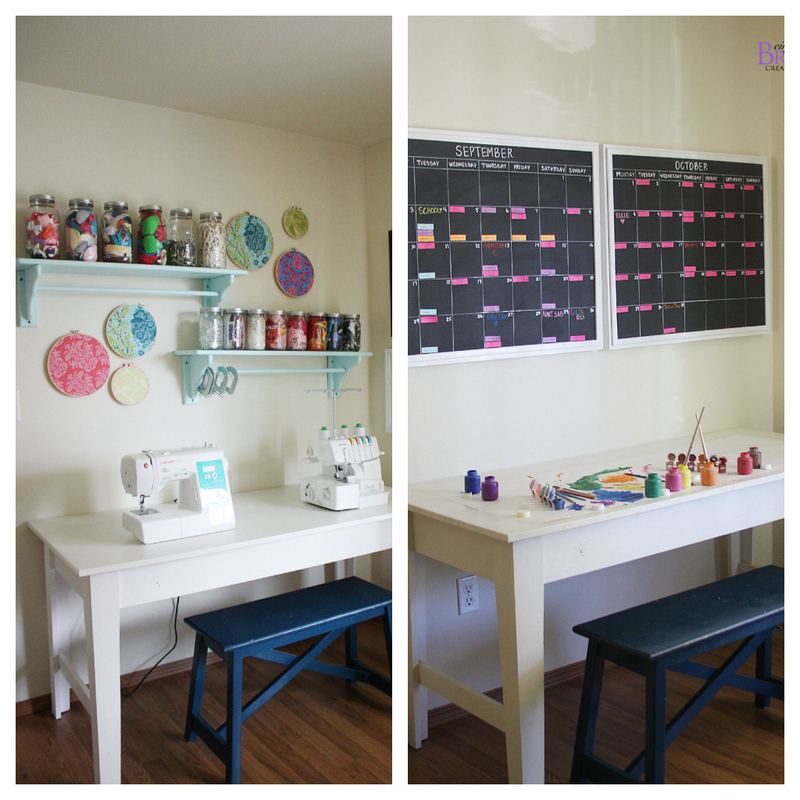 I made myself two calendars and hung them above the sewing/kid art table in my craft room. The calendars are big which is great. I have room to write everything I need to and still be able to read the writing! Hopefully now I can be a super organized Mom! Not the Mom I was last school year that shows up 5 minutes late for the soccer game and forgets the soccer snack.